Does your child have temper tantrums? If you answered "No" to that question, you get a prize! But chances are you answered "Yes." The question is not so much "How can I eliminate temper tantrums?" but is probably "How can I deal effectively with temper tantrums?" First, let's discuss what is a temper tantrum. Think about it. Your child wants something and he or she cannot have it. Your child may want an ice cream cone, may want to stay up later, or may want to watch more TV. Whatever it is, they want it and cannot have it. If you think about it, we as adults also want things we cannot have. Sometimes we also "blow up" and lose our tempers. We usually don't lay on the floor and beat our hands and feet, but we often scream. We often sulk. If we are driving and someone gets in front of us, we may honk our horn for a full minute. Your children do not have a horn to honk and may not even have the words to express how they are feeling. Their vocabulary is not as big as yours and cannot express what they are feeling. Imagine how you would feel if first you are upset and then, on top of that, you can't even express what you are upset about. How frustrated would you be! So the first part of dealing effectively with a temper tantrum is to understand what is going on for your child. Once you understand what is going on for your child it is very easy to realize when the best time to deal with it is. Or actually, is not! When your children are angry, upset and frustrated, they cannot calm down and they cannot change their behavior. Once a tantrum gets started, I would advise you to not try talking to your child. To change a behavior, you either have to change what comes right before the behavior or what comes right afterward. For example, if you offer your child a sweet if he stops his tantrum, you will probably be reinforcing the tantrum behavior, something you do not want to do. Negative reinforcement also works, but I would not advise that. If you hit your child every time he has a tantrum, it would eventually stop the tantrum but will lead to much bigger problems down the road. So do not follow that route. Even screaming at your child is not a good idea. That just shows your child that screaming when you are angry is okay. That is sort of like the tantrum he was having in the first place! What I am about to tell you may sound counter-intuitive, but it works. Ready? Do nothing. Okay, if you want to do something, take deep breaths. Be a role model for your child in how to deal with anger. While she is having a tantrum, sit next to her and take deep breaths. Chances are that the first time you do this, your child will look at you like you have lost your mind! That's okay because you want to break a routine and, by doing that, change a behavior. Once your child calms down, take her onto your lap and give her a kiss and say "I love you and I want to teach you something." This will probably intrigue your child, and you now have a "teachable moment". Simply explain that everyone gets angry and it is okay to be angry. The problems start with what people do when they are angry. Some people who get angry scream a lot and that doesn't help anything. Some people who get angry start hitting, and that is a very bad way to deal with it. Explain that you were angry because of the temper tantrum, and you choose to take deep breaths and calm down and then talk about it, and that is a very healthy way to deal with anger. Tell your child that from now on, when he or she gets angry, you are going to teach her to calm down and talk about it. Explain that learning new things takes a while, and you expect that your child may not get it right every time, but that is okay. You will keep teaching until she gets it! Problems are simply patterns. Think about it. If you run out of money on the 25th of every month, it is a pattern. If your boss gets upset with you every time you hand in a report late, it is a pattern. If we change the pattern, we may fix the problem. Is there a pattern to your child's temper tantrums? Does it happen at 2PM every day when he is ready for a nap? Let's change the pattern. Perhaps at 1:45 every day you can sit down and read a book to him.. Does your child have a temper tantrum every time you want to leave the park? Perhaps you can throw a ball back and forth as you are leaving the park so the play is not stopping. Make a list of all the temper tantrums for one week, and look for a pattern. Then, break the pattern. 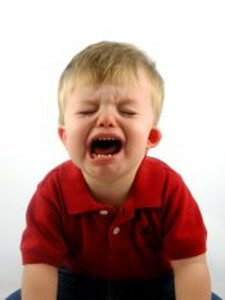 With a little effort, you can eliminate most of the temper tantrums and teach your child an important lesson for life! So in a nutshell, first look for a pattern in your child's temper tantrums, and try to break the pattern. If a temper tantrum starts, let it run its course and model for your child how to deal with being upset. Shaya Kass, PhD has a life mission of inspiring people to live in happiness and in gratitude. One of the ways this is accomplished is by helping parents be inspired and helping them to raise inspired kids. Get a very special report for free - How To Change Your Parenting Mindset - at [http://www.TrulyInspiredParent.com].